Aliens Online Video Slot- Nobody can hear you! 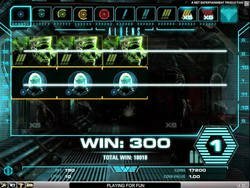 Aliens online slot is a brand new video slots game from Net Entertainment which was initially launched in February 2014 at ICE Totally Gaming conference at the ExCel London. It was officially released in April 2014. The game was based on the horror movie franchise which became popular in the 1970s to 1980s. Net Entertainment is clearly one of the leading casino game makers. But the company has outdone itself in its recent collaboration with Twentieth Century Fox to develop Aliens online slot. The game features stunning 3D graphics. In fact, this is the first casino option from Net Entertainment to have real-time 3D graphics. It actually garnered "Innovator of the Year" award at the International Gaming Awards. The only mission in this slots game is to survive the onslaught of aliens and monsters. Players start by selecting the coin value and determining bet value. Aliens online slot is set in space where a player gets full control in fighting aliens and monsters. It is a 5-reel, 15 bet lines game. The movie is relived in three stages - The Search, The Hive and The Encounter. The Search stage is the first level where a player scans the premises to look for alien activities. He gets to collect symbols in this level that has multipliers as many as 14 times. The Encounter is the second level where a player's goal is to go through the waves of alien attacks in order to reach the Queen's Hive. Multipliers are likewise available here. Surviving level 3, The Hive, gives a multiplier up to 240 times bet amount. Terrifying scenes will keep players at the edge of their seats as they navigate the different stages. Add to that a horrifying soundtrack, this game will surely capture gaming enthusiasts who are fans of the hit sci-fi movie.